Ah, hen parties: late nights, fizz and fun with all your favourite girls! However, we know those hours of drinking, dancing and having an amazing time, can sometimes make us all feel a little worse for wear the morning after... 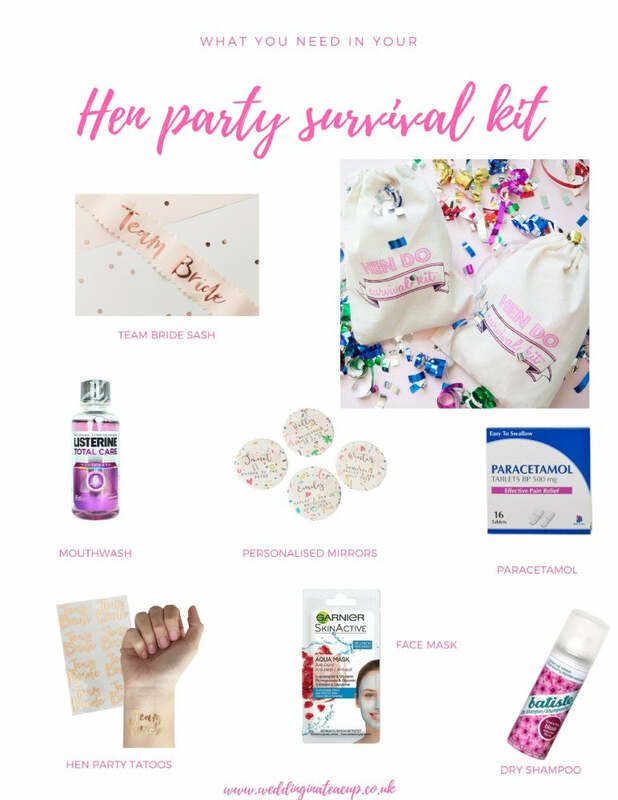 But before you even think about toning down your 'do' we’ve put together a fail safe guide for creating an amazing hen do survival kit, that’ll keep you and your hens looking and feeling fresh throughout your hen party and the morning after the night before. You’re welcome! First things first, you need a bag to put all of your hen party goodies in! Our large cotton pouches and totes are perfect for packing all those hen do essentials in - just fill and hand out to your hens! Feel fresh as a daisy, even after late night drinks and kebab shop stops (we won’t tell anyone), with some minty mouthwash. Make each of your hen party guests feel special with personalised mirrors - not only are they a must for last minute pre-party touch ups, but also come in super-handy the morning after, for make-up sessions without leaving the comfort of the sofa! Hopefully you and your hens will wake up hangover-free, but should a fizz-fuelled headache occur, a few painkillers and glasses of water should have you sorted in next to no time. Just pop a few paracetamol in your hens’ kits to save the stumble to the chemist. Unite your I do crew with Team Bride tattoos! A perfect ice-breaker that everyone, from the mother of the bride to the bridesmaids, will love, fun tattoos allow you to celebrate in sophisticated style and make for memorable hen party photos. Banish tell-tale I’ve-had-no-sleep dry skin by giving it a moisture boost! Apply a hydrating mask or DIY by making a magical mask of oats, honey and banana for you and the girls to apply before heading out to brunch. Who wants to spend precious time washing and drying their hair when there’s fun and fizz to be had? Give your girls the gift of more time relaxing and having a post-party snooze by adding some dry shampoo to their survival kit. Looking for hen party decor and gifts? Shop here.